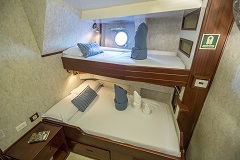 This uninterrupted 8 day itinerary aboard the elegant Mary Anne takes in many of the highlights of the Galapagos Islands and also travels to the volcanically active western side of the islands which are interesting for their unique flora and fauna. 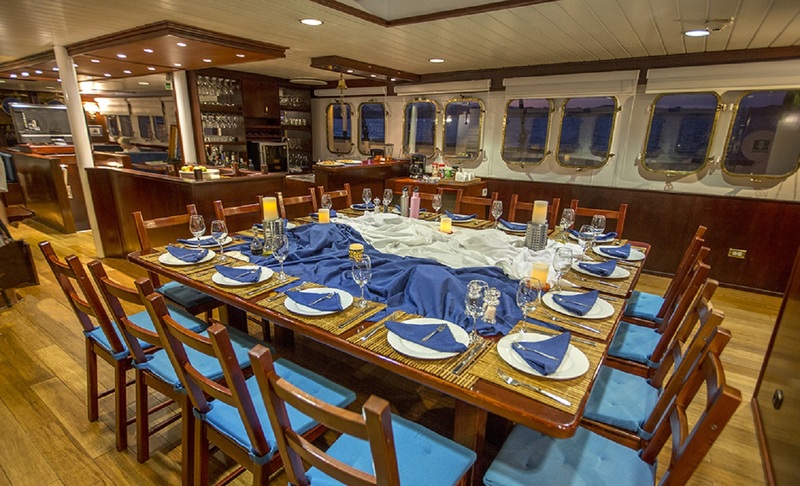 Taking a maximum of 16 guests this sailing-ship is a truly romantic way to appreciate the Galapagos Islands in all their glory. 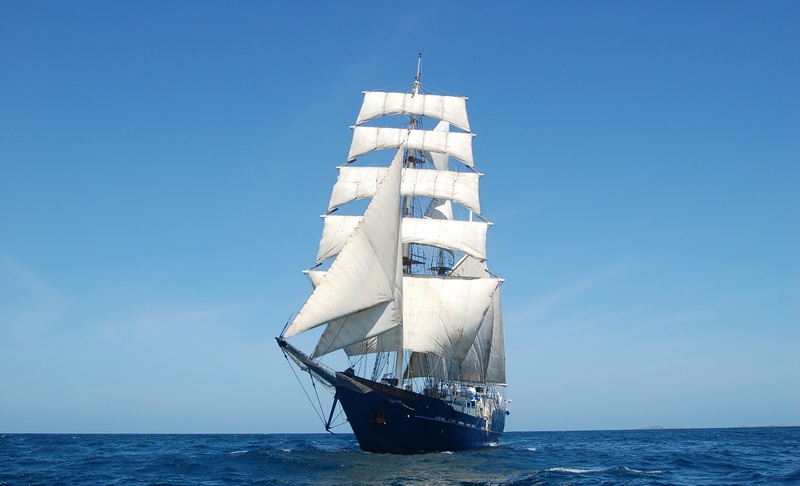 Cruise on board the most elegant (and only 3 mast barquentine) sailing vessel of the islands. Enjoy unique on-board activities like: sailing lessons, nautical knots contest, navigation by the stars and cooking classes. Visit the volcanically active western islands and have the chance to see penguins. After arriving at Baltra airport we will be greeted by an Angermeyer Cruises representative and then board a bus that will take us to Puerto Ayora for the first visit on the islands: the Fausto Llerena Tortoise Breeding Center. Here, we will see tortoises from different islands. The animals are found in large semi natural pens for their protection, but also to ensure an easy view for the tourists. The pens are divided according to four different stages: eggs, neonates, juveniles (held here until they are mature enough to be "repatriated"), and adults. Afterwards, we will head back to Puerto Ayora, where we will have some time to explore the town and shops by ourselves before boarding the M/Y Passion at around 5:00 p.m. Once on board, we will be welcomed by the crew and captain, have a short security drill and enjoy dinner and the briefing for the next day´s activities. We spend the day on Floreana, legendary homestead of infamous Baroness Eloise Von Wagner de Bousquet. Wet landing onto the olivine beaches of Punta Cormorant; we will be seeking Greater Flamingos on our way to another special beach with the finest sand you'll set your foot on, a sea turtle nesting ground where sharks and rays also visit regularly. We end the outing on a short panga ride to Devil's Crown, a key snorkelling site. After lunch, we will visit Post Office Bay (wet landing), where you can drop your postcards in the barrel as the whalers did centuries ago. This morning we will visit Floreana Island´s Black Beach to learn about the intriguing human history of the island and its first inhabitants. Floreana was the first island in the archipelago to be inhabited, since it has one of the very few fresh water sources. We will visit this fresh water source known as Asilo de La Paz, as well as the caves that served as hideouts for pirates and where the first Galapegueño was born, according to the stories of Floreana, which involve the infamous Baroness Eloise Wagner von Bousquet and her lovers who mysteriously began to disappear after settling on the island. After our visit, we will have the best opportunity for a not‐so‐common yet well beloved activity in the archipelago, a full afternoon navigation to look for whales and dolphins. 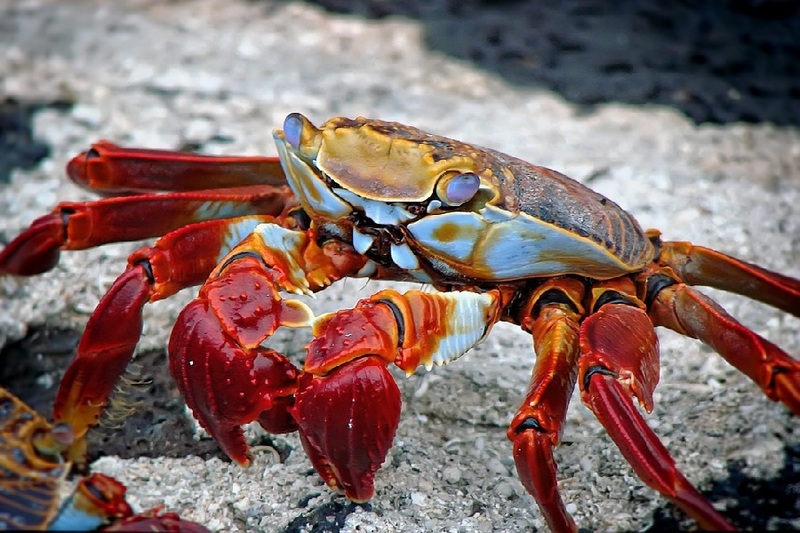 The waters of the Galapagos form the second largest marine reserve in the world very rich in wildlife. 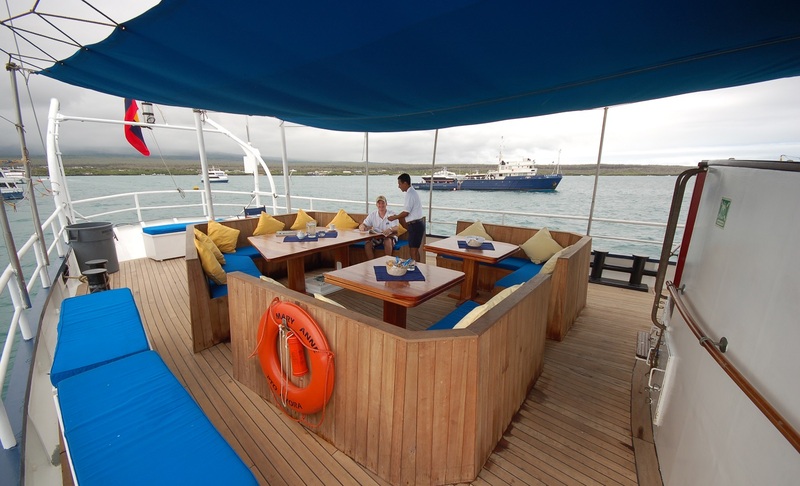 We arrive at Isabela, the largest island in the Galapagos. After breakfast, we step ashore at Punta Moreno (dry landing) onto a superb pahoehoe lava flow surrounded by giant shield volcanoes, some of which are still active! From here we will do a short hike to a lagoon where flamingos are usually present. We disembark at Urbina Bay (wet landing) onto a black sand beach, nesting site for green sea turtles. 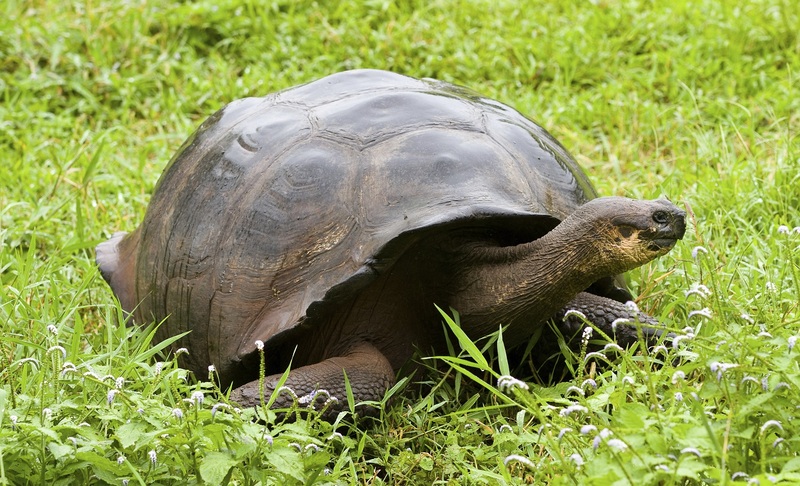 We take a brief hike inland in search of land iguanas and giant tortoises (seasonal) that migrate to and from the highlands. At the beach, we will admire the remains of a geological uplift exposing coral heads and marine fossils and if the sea conditions and time are on our side, we will also snorkel in these waters. Dry landing near Tagus Cove, historic pirate hideaway where names of countless ships are recorded for posterity on the cliff face. 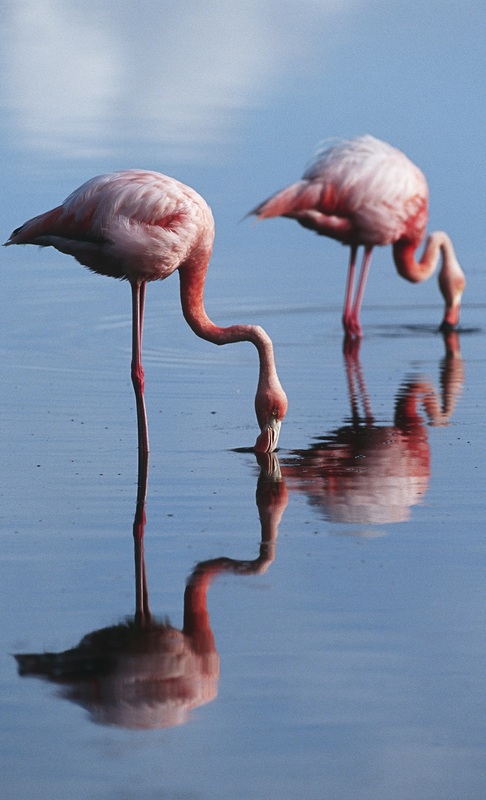 Hike through beautiful Galapagos landscapes to Darwin Lake, a salt‐water crater lagoon surrounded by tuff stone. We cross Bolivar Channel to Fernandina Island, one of the world's most unspoilt sites, and disembark (dry landing) at Punta Espinosa. 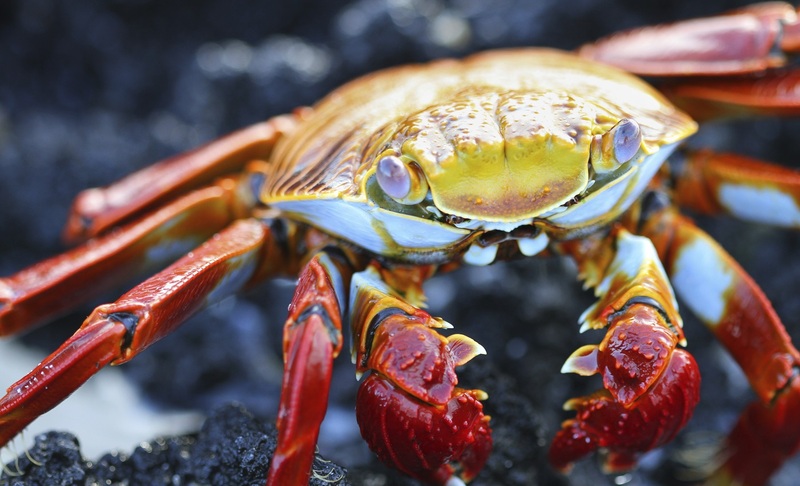 Strolling along the shoreline, we will be on the look out for Flightless Cormorants, Galapagos sea lions, Galapagos penguins and hawks, sooty-coloured marine iguanas and bright red-orange Sally Lightfoot Crabs. At Buccaneer Cove we will take a panga ride around the beautiful coastline. This place got its name due to the fact that used to be a refuge for British Buccaneers during the time they would anchor here to collect supplies and clean their ships among other activities. The cove is very scenic with views of the cliffs and a dark beach. Do not forget to look for two unusual rock formations known as ‘the monk’ and ‘elephant rock’. After three days exploring the fabulous western islands, we head to central Santiago to disembark at Espumilla (wet landing), onto a golden‐colored sand green sea turtle nesting site. 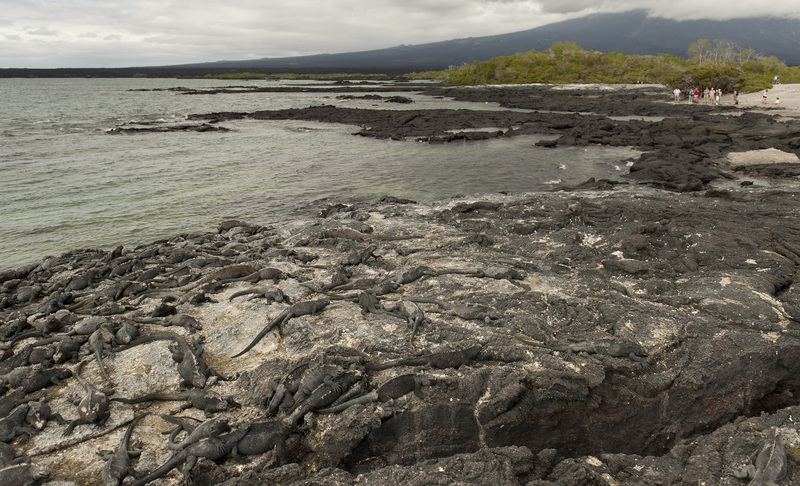 We head across to Sullivan Bay (dry landing) in Santiago to walk over a recent lava flow, including very fresh pahoehoe lava formations, lava bubbles containing crystallized minerals and pioneer plants. 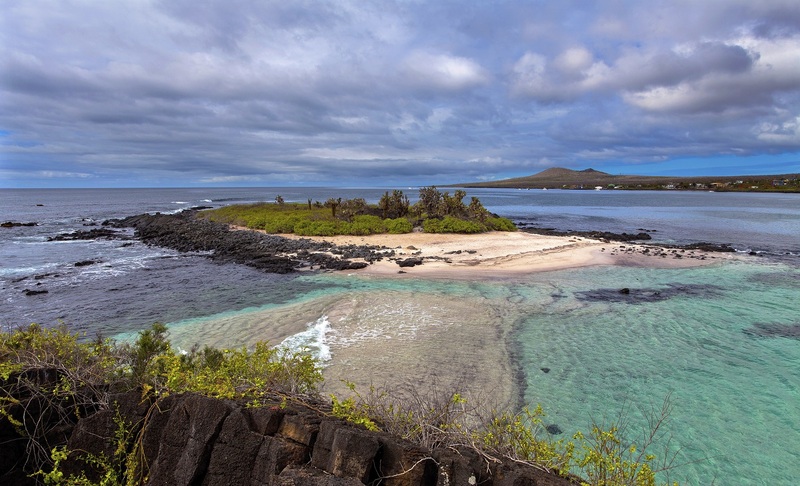 Along the shoreline, we may find Galapagos penguins and herons going after small fish. 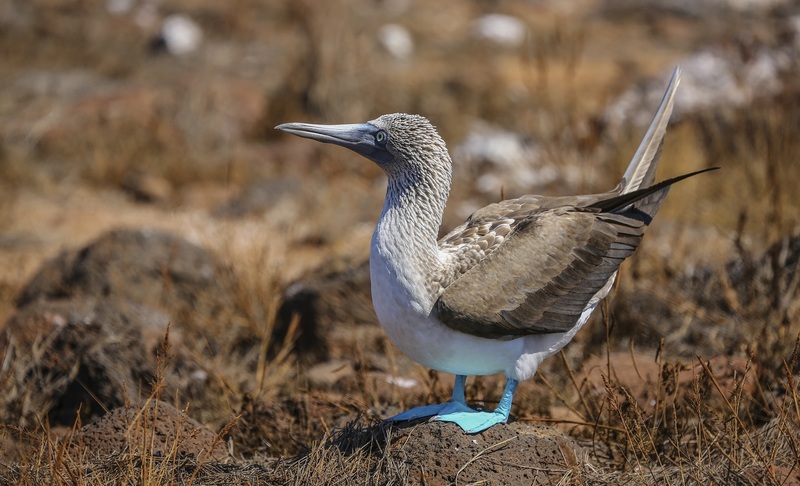 We disembark on North Seymour (dry landing), a small uplifted island, where we will walk right up to bird nesting colonies of the two species of frigate birds, blue‐footed boobies and swallow‐tailed gulls, and experience, depending on season, spectacular mating ritual displays. Mosquera is a small islet located between Baltra Island and North Seymour measuring about 160 meters across and 600 meters long. 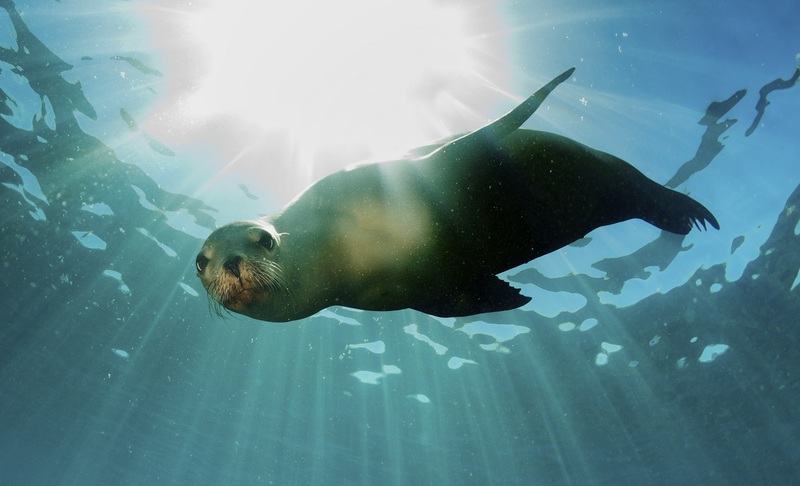 It is home to one of the largest sea lion colonies and is also a haven for shorebirds. Orcas occasionally come to the islet to feed on the sea lions. After this visit, the ship will sail to Baltra where passengers ending their trip will disembark and passengers beginning their cruise will join us on board. 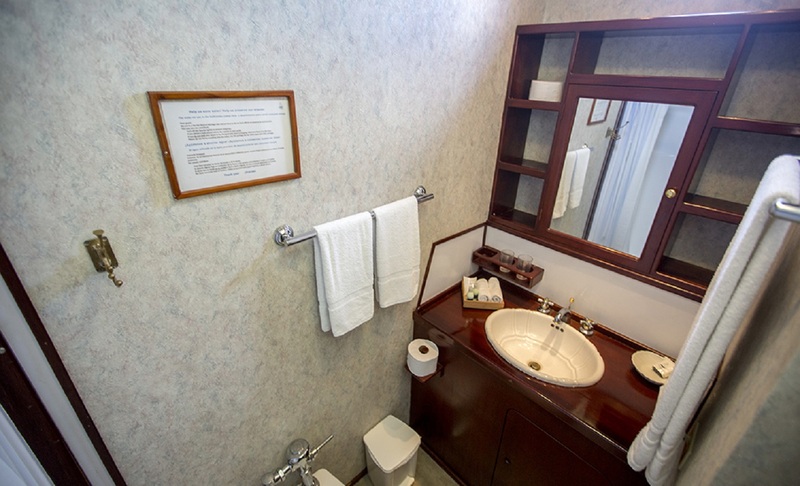 Private bathroom with hot water, one double lower berth and a single upper berth, closet & porthole window.